NASA's Solar Dynamics Observatory views our sun in 10 different wavelengths because each wavelength reveals different solar features. 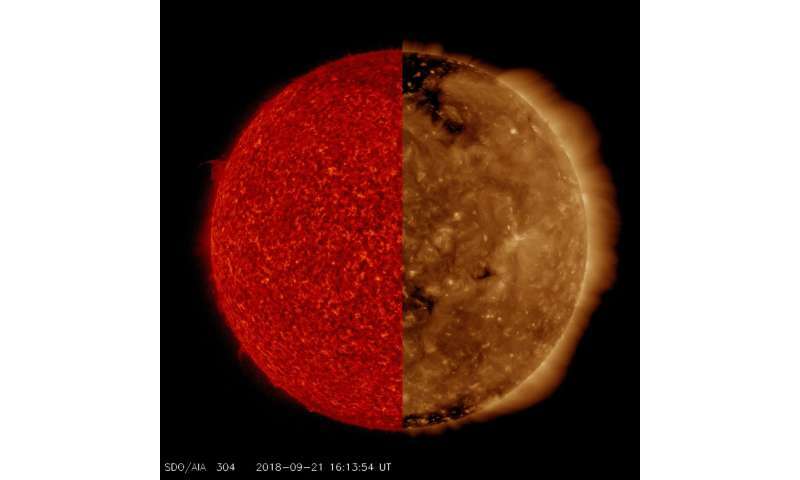 This Sept. 21, 2018, view of the sun uses two selected images taken at virtually the same time but in different wavelengths of extreme ultraviolet light. The red-tinted image, which captures material not far above the sun's surface, is especially good for revealing details along the edge of the sun, like the small prominence at the ten o'clock position. The brown-tinted image clearly shows two large coronal holes (darker areas) as well as some faint magnetic field lines and hints of solar activity (lighter areas), neither of which are apparent in the red image. This activity is occurring somewhat higher in the sun's corona. In a way it is like peeling away the layers of an onion, a little at a time.